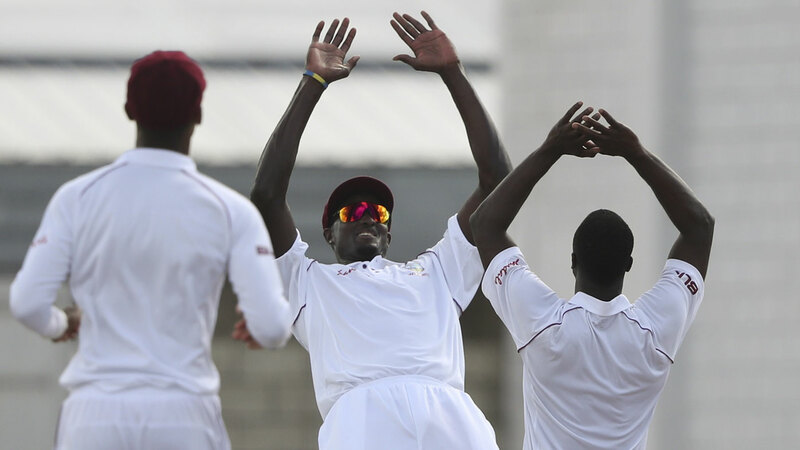 West Indies have bowled out England for just 77 runs in a remarkable second day of the first Test in Barbados on Thursday. Fast bowler Kemar Roach ripped through the England line-up, taking 5-17 off 11 fiery overs at Kensington Oval to give the home fans, outnumbered by visiting English supporters, plenty to cheer about. It was England's fourth lowest total against West Indies. West Indies, who opted not to enforce the follow-on, enjoyed a 212-run lead, a most unlikely scenario after being all out for 289 earlier on Thursday. The four-pronged Windies bowling attack turned back the clock with scenes reminiscent of the halcyon days of the 1970s, when they regularly terrorised the world's best batsmen. Roach was well supported by captain Jason Holder (2-15), Alzarri Joseph (2-20) and Shannon Gabriel (1-15), all getting plenty of bounce and enough movement to tie the batsmen in knots. Holder picked up the prized scalp of Joe Root with a magnificent delivery that trapped the England captain lbw for four. Earlier, the home team lost their final six wickets for 49, a portent of things to come for England on a pitch that for most of the first day did not present too many issues for the batsmen. Pace bowler James Anderson equalled an Ian Botham and England record when he took his 27th five-wicket haul. He picked up one more scalp on Thursday morning - tailender Joseph for a duck-- as the Windies added 25 runs to their overnight total, with England taking nearly an hour to mop up the final two wickets. Anderson finished with 5-46 off 30 tight overs, while fellow paceman Ben Stokes chipped in with 4-59. Shimron Hetmyer was the last man out, caught behind off Stokes going for an agricultural slog. Hetmyer, who will play for Virat Kohli's Royal Challengers Bangalore in the upcoming IPL, top scored with a highly impressive, hard-hitting 81 off 109 balls.